Please find below some of the highlights of Wednesday, 29 June at the 66th Lindau Nobel Laureate Meeting. Browse through our mediatheque for more videos of #LiNo16! Large-scale quantum computing will change our lives as much as the internet revolution and cell phone revolution – when it materializes. Frankfurter Allgemeine Zeitung, one of Germany’s premier broadsheet papers hosted a very interesting press talk on artificial intelligence. 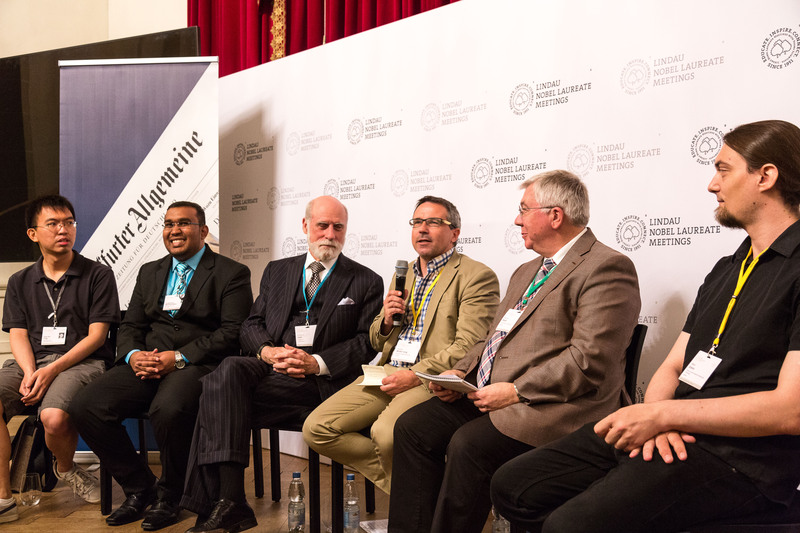 Participants of the press talk on artifical intelligence, from left to right: Yuan-sen Ting and Arrykrishna Mootoovaloo (young scientists), Turing-Award winner Vinton Cerf, Joachim Müller-Jung, head of the FAZ’s science/nature division, Prof. Rainer Blatt, 1 of 2 scientific chairmen of #LiNo16 and Mario Krenn from the Vienna Center for Quantum Science and Technology. For more pictures from #LiNo16 take a look at our Flickr-account.